The same day the Signoria answered the Argos petition, 26 July 1451, it answered a much longer petition from Nauplion. Nauplion had more money, and better grammar and spelling in its petition, but it, too, was also having a difficult time. Venice acquired Nauplion and Argos in 1388, but then Theodoros I Palaiologos, the Despot of the Morea, occupied Argos. It took until 1394 to get him out without actually going to war. Argos had its own administration for three years, but after the Turkish invasion in 1397 (see Section 1 of the Argos petition) Argos was administered by Nauplion. In 1442, Argos was again given its own administration. You will see in the Nauplion petition how infuriating this was to them, the contempt they have for Argos, and how they have tried to get Argos back under control. You will also see how Argos has tried to fight back. Again, this is my paraphrase of sections of the Venetian document. 1. Your Signoria promised your subjects of Nauplion to observe their traditions, and the citizens consented to a tax from which you could collect a certain sum to pay the salaries of the podestà, the guard, and certain other positions, and the rest would go to repair the walls, and other needs, such as supplying the galley. Your Signoria has added the salaries of the rettor of Argos, the camerlengo, and castellan, and so the money that should be put into repair of the walls is spent on salaries. The city gate is in a dangerous condition and the walls of the suburb are crumbling. The port needs clearing, parts of the castle walls are earthen, and the rest near ruin. Your citizens are in danger because everything is open and anyone can go in and out at any time as they please. We are in the jaws of the wolf, by land and by sea. Your subjects and loyal citizens humbly supplicate and request that you will provide for the needs and necessities of this place. We ask you how the funds of this city can pay the aforementioned salaries since God knows the taxes that come in can in no way supply them. Response: Since we desire the safety of the city and so the walls are repared, for the next 5 years the treasurer of Nauplion will retain from every salary 2 hyperpera out of every 10, and the fine from every judgement be paid to the treasury, and these used for construction and repair of the walls. We further desire that the podestà convoke the council and persuade them to contribute to the said work on their part. 2. Some of the rettori of Argos, and especially the one there now, against the will of Your Signoria and against custom, have taken new action harmful to your treasury. From ancient times to the present Nauplion and Argos were one place, joined, with one ruler, one treasury, one signoria, and the treasury always at Nauplion, but the present rettor wants to divide the territory between Nauplion and Argos, and have a treasury at Argos, and farm the taxes and do things never done with great prejudice to your treasury at Nauplion, and the rettor collects his salary from the treasury at Nauplion. We remind Your Excellency that Argos compared with Nauplion is a village and a warehouse, and no one lives there but people who work the land, all foreigners,* while Nauplion has good citizens, and has maintained its old traditions better than any other terra. Your citizens and feudatories of Nauplion have their own land and collect their rents, and now the rettor of Argos will not let them collect, but insists that they must move from Nauplion and reside in Argos if they want to collect. There never was such injustice. We remind Your Signoria for the good and well-being of your place, so we can live openly, that it please you to direct the said rettor, and his successors, that there should be no such innovation but that things are to remain as they were; that the rettor does not collect his salary from Nauplion; and that he cannot make concession of or alienate or sell any land, but that it all should be handled in Nauplion as it was before; and that the administration of Argos should be under that of Nauplion as it was in times past. Also, that the rettor of Argos cannot hold criminal proceedings without the consent and direction of the podestà of Nauplion, and that anyone who has a complaint should appeal to the administration of Nauplion, and in this way it will work to the honor of Your Signoria, otherwise manifest peril will follow one day when those of Nauplion are cut apart from those of Argos. Response: 1. As of last June 27, we provided that the rettor of Argos may make no impediment to our taxes. 2. We write and direct the said rettor of Argos that he permit our feudatories to live in Nauplion and collect the rents they have in the territory of Argos. 3. We do not want to make innovations in criminal matters, but the liberty and authority of the rettor of Argos is to be preserved according to his commission. 3. We remind Your Signoria, for the good and well-being of your città, that because misser Despoto Greco [Demetrios Palaiologos] and his barons and subjects appropriated the territory of Santa Marina of Didymo, and castra, and other territories under the jurisdiction of Nauplion and Argos from the beginning, and also planted by the former treasurer, ser Giovanni Catello. This should come back under your jurisdiction and the treasury of Nauplion have the benefit. Also all the wheat and grain will be brought to Nauplion, so that we can give to your other places that have need. Response: We will write the Despot Demetrios in appropriate manner that he should return the lands and castra, and that he should make no more attacks on our Albanian subjects. 5. Also, we remind Your Signoria for the good and well-being of your commune, that since the old men who knew the boundaries and fields of your commune are dead, a thousand conflicts have developed between Your Signoria and your feudatories. Please direct the podestà to make new descriptions and assignments so that everyone knows his own and the citizens of Venice have what is due them. Response: With all consideration, we want the podestà and captain of Nauplion to correct the errors and to consign lands to the feudatories, keeping the records of all the lands in the Nauplion treasury. 6. We remind Your Signoria for the sake of good order, that traditionally when someone was banned from Nauplion for homicide he was banned from Argos, and when he was banned from Argos for homicide he was banned from Nauplion, but when the rettori came from Venice to Argos, this was not observed but if one committed homicide in Nauplion he went to Argos, and if in Argos he came to Nauplion. This is against honor, and it happens daily. Please direct that it be as before, so that one banned from Nauplion is also banned from Argos, and vice versa. Response: It is our desire that a person banned from one place be banned from the other so that homicide and crime end. 8. 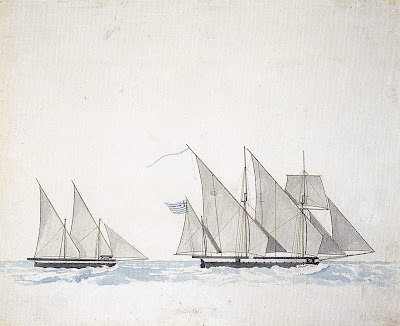 We remind Your Signoria for the well-being of your subjects and also for the benefit of the treasury that the podestà here need firewood, and since there is no large gripparia here to send, so they have been sending the boats here. They unload at the port and the former administrators have demanded that the villeins here carry the wood on their mules to his residence, and then the gate is closed and they cannot go out to work. Considering that the administrators here are poorly paid, will Your Signoria assign 3 ducats a year from the treasury to transport the wood? Response: We do not want to make any innovations: let the custom continue. 9. We inform Your Excellency for the well-being of your commune that in the territory of Nauplion, Thermissi has such remarkable salt wells that the whole Levante can dig out a well of gold ("un pozo doro"). This is not guarded and the Albanians and subjects of the despotate come take the salt. One could say that the whole Morea is supplied without spending a soldo. *** In this way your treasury suffers great damage. If Your Signoria sends an ambassador to the Despot and this matter is settled, your treasury would have great profit. We remind Your Signoria that ships go to Syria for salt and leave money there. It is more convenient to come from Candia for Nauplion salt, and the salt is better than that of Syria. This would be better and make a great profit, and benefit for your città. Response: We are writing the Despot in the appropriate form and will let you know what happens. 10.When the Despot or his barons come to your territory, and the administration has to give them grain for their horses, and feed them, and they do the same thing at Argos, that is double the expense for your treasury, and makes a heavy tax on your poor subject who have to bear the expense. This is contrary to custom. We ask you to pay for the gifts. Response: The Despot and his barons come rarely and the expense is minimal. We will not make any innovations. * The 'foreigners' are primarily the Albanians, and some Greeks, from the Morea that Nauplion invited in to replace the huge number of Greeks taken away by the Turks. ** Contarini's knowledge of Greek was extremely useful in handling the case of the Anonymous Naupliote. *** A soldo was a very small coin. A day laborer would earn perhaps 12-15 a day. 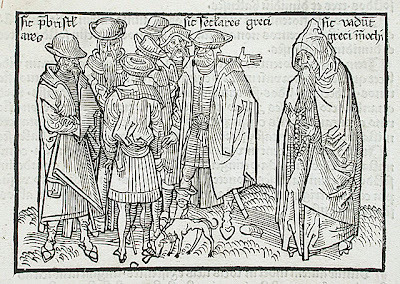 Greeks, by Erhard Reuwich, 1455-1490.
together, which is indirectly what this blog is about. On 26 July 1451, the signoria of Venice responded to a petition from the citizens of Argos that had been sent to them in late 1449. The signoria was not often swift to respond. It is informative on many levels, but it particularly illustrates that the citizens of Argos -- which had a population of fewer than 500 -- were having a very difficult time of it. Longtime readers of this blog will recognize the incident of Section 6. I am giving here my paraphrase of parts of the petition. I have tried to keep the tone of the language, but my spelling and grammar are much better. Each section has the signoria's response to the issue. 1. The commune of Argos asks that you recall that the Turks took Argos in 1397, 3 June, and took 14,000 souls, and burned the land and the castle and left. Nauplion was much harmed by the Albanians who raided. Your Signoria wanted residents in Argos and directed Nauplion to announce that anyone who wanted to come their with their families would be free persons, and free from payment of any dacio. * Each would get 40 stremmata of public land and 4 stremmata of vines, and a burnt-out house. There were 18 families from the Morea who took this privilege, then 7 more families, and these increased to 115. The houses were rebuilt and the vineyards are growing. These privileges misser Piero da Canal, the chamberlain, recorded, as did misser Zorzi Corner, the chamberlain who was captured by the Turks. The records were sent to Venice to the Corner house. So we ask that you please direct the relatives to give back the records to the Signoria, because Nauplion will not allow us to copy the ones they have. Please do right and not wrong, because we have expended our labor and money on these properties. Response: We direct the podestà of Nauplion to read this petition carefully and to have a copy of the land records made. 2. Also, we who have lands and have worked them have to pay one half of the produce to the lord of the land and the person who planted has the other half for the work and expense he has made. If he wants to give a dowry to his daughter or a gift to his son, or sell the land, he needs a paper. Please let us have our share according to tradition. Response: We want to preserve custom, and the rettor of Argos is to make descriptions of all the said lands, so that we do nothing against custom. 4. Also, a band of Albanians attacks the place and does robberies and murders at the fair, and they waste the fields and vines and rob the gardens. There are no armed men here except the men they call the Greek stratioti and the rettori have given 15 of them land and paid 2 gold ducats apiece for a man and his horse, for the good of the communità. Response: We don’t want to make any changes about this, as they get the land for service. 5. When the Greek despots come through Argos, we have to give presents. ** Would you please pay for them? Response: This is a small expense and we want to continue the usual practice. Response: We are writing the Despot Demetrios in the usual form that he should see that similar incidents do not occur. 7. Every two years the rettor makes an announcement that anyone who holds land from the commune should show his papers, under penalty, and the landholders from Nauplion never come here to show theirs. Response: We order the podestà of Nauplion that the landholders from Nauplion should immediately go to Argos with their papers so that they can be seen and the lands known. 8. Also, we ask that you will please send us 2000 ('duga migiara') arrows for defense, and since we are poor in cash we will pay you in grain. Response: We will send 3000 arrows, and another 2000 from Crete, and you will give the storehouse in Nauplion grain for their value. 9. Also, we complain about misser Zan Contarini who was vice-rettor in Argos, when he assigned land he asked for cash gifts. We ask that the money please be returned. Response: We want the rettor of Argos to diligently inform himself about the money acceppted by ser Giovanni Contarini for land concessions, and arrange that our loyal subjects have their money back. * Dacio: annual payments to the lord for the house, and for each piece of land. ** We don't know anything about presents for the despots, but when the Ottoman governors of the Morea visited Nauplion around 1480, Bartolomeo Minio's gifts usually included a silver cup, cloth, sugar, fresh fish, bread, and wine. Most of these were given by landholders and merchants who had an interest in the prospective negotiations. *** This is told more fully in Archons: Demetrios Laskaris Asan of Mouchli. On occasion I follow the lead of Kostis Kourelis and Bill Caraher and engage in non-invasive archaeology in the neighborhood. It is much nicer to be able to call it 'non-invasive archaeology' than 'prying.' It isn't very exciting, but how much of our lives is? 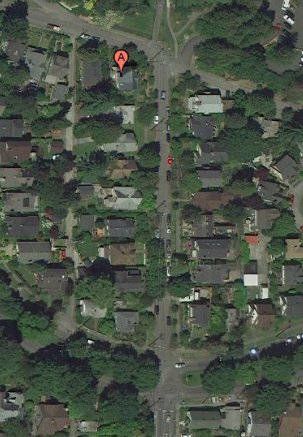 The mass of green at the very bottom of the picture, to the left of the street where we live (A marks our house), has been my latest project. Face-to-face with that mass of green, you see a mess. You see the stump of the tree that provided that mass of green. It is a liminal space, this area: the boundary between the family neighborhood above, and ours across the street, and between both of us and an erratic street squalid with student rentals and fraternity back lots. Three or four years ago, on a Saturday night a small black bear wandered up from the lake shore, somehow found itself two blocks down the street from us, strolled through the fraternity drinkers milling in the street, climbed across a couple of porches, and ended up at the bottom of the first photograph, where the forces of the law shot too many tranquilizers into it. The corner, where the mass of green shows in the first picture, is where a hill was sliced away for the sake of the road grade -- this neighborhood was laid out and built between 1900 and the War to End All Wars. The corner was terraced with large uncut stones which have since collapsed. In recent years tree-trunks and stumps have been intentionally positioned across the slope . Up the sidewalk to the right -- always dark and damp, no matter the weather -- following the main tree-stuffed road to the left, is a long retaining wall, its construction varied according to the tastes of the builders of the houses above. The houses have steps up from the sidewalk which are almost completely unused, as you can drive up and around the hill to get to them. Some have garages built into the side of the hill, a very common construction all over Seattle. Here you see the cut in the curb for a driveway whose garage was allowed to collapse. The hole filled in over the years with rubble, fallen branches, and leaves. An electric power pole was planted in the middle of the driveway. At the time the neighborhood was laid out, an electrical relay station was built to the left of the driveway, and probably the garage belonged to it. In mid-century, it was decommissioned About ten years ago the little building was acquired by an architect for his studio. He turned the relay station into an Art Deco whimsy using the most minimal gestures of color and shape, taking his lead from the three squares of bricks inlaid on edge at the time of the original construction. There was a fire in early January while we were in San Antonio. Since last week, the debris has been cleaned up and the building rewired for electricity. We are waiting for the next transformation. "the valor of our stratioti"
Sketch of a Turk, Gentile Bellini, 1480. Yesterday a slave from the Porte arrived here unexpectedly who brought letters from the Most Illustrious Sultan . . . The third letter, which was addressed to me alone, contained complaints by the Ottoman governor of the Morea about the many excesses perpetrated in the Morea by many stratioti and other subjects of Your Excellency, both from Nauplion as well as from your other places in the Morea, and he sent me a good many papers in which are -- all annotated in order -- 56 offenses, including, among others, the insult and rebellion made in the Mani by Kladas and some of the stratioti from Nauplion in time past.
. . . at present there have returned to the territory of Your Excellency some of those banned for the aforementioned excesses -- that was the reason the former governor of the Morea . . . requested and constrained the magnificent messier Bartolomeo Minio . . . that he would pardon them and received them back into favor, because the said governor (who was the more offended and more powerful because of ending the great scandal) had done the same and our administrator was reluctant to consent, and did something that he should not according to our laws . . . This seems an incurable disease and a scandal between us. Then two days later Dario had a meeting with the Lords Pasha. They informed Dario that they knew Venice was not at fault, but the administration of Nauplion and the citizens were sharing the stratioti loot, and had in their houses the robes, the turbans, and swords, and other possessions of the murdered Turks. In the year since the end of Minio's term, all his restrictions and concern for law and peaceful relations with the Ottomans had been abandoned. 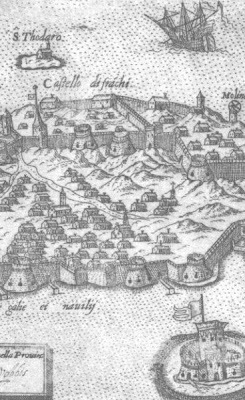 The Ottoman governor had been ordered to 'cut to pieces' any Venetian stratioti found in the Morea, and not to accept anyone who was not a merchant or 'original citizen' of the country. Dario told the Lords Pasha that Venice would have no problem with that. They told him that Piero Busichi was the commander of the thieves, and had become rich from the system. Piero Busichi was well-known to the Signoria. Piero was one of four Busichi who had to have special pardons for all their homicides so that they and their troops could be drafted for the Ferrara war. He first appeared in Venetian records in 1473 when he was hired for 50 ducats a year and a robe worth 100, plus pay for his company of 25 stratioti. When Ismail Pasha and Minio were trying to settle the Kladas revolt, he acted as go-between. Then the next year, at the time of the Ferrara draft, he had led a rebellion against Minio for more pay. He got it. Five hundred and forty stratioti had enlisted under him for Ferrara and they were so successful that he was given a bonus of 8 ducats for each of them, in addition to the 12 he had already been given. As soon as Dario's letter reached Venice orders were given for the arrest of the Venetian governor of Nauplion and a replacement was sent. Dario wrote again. There was recently brought to the Porte, in a cart, a timariot named Ciri Pasha, robbed and beaten by our stratioti just when he was leaving the Morea, as he said, and 100 ducats taken, and clothes and silk cloth, and other possessions, and the pashas ordered that he should be sent to my house immediately so I might see for myself the valor of our stratioti. I responded to those who brought him that I deeply regretted the occurrence, which I did not know about, but I wanted to be informed by them about the persons, so that they could be identified, and would write to Nauplion, and if the malefactors are there, they would settle the accounts and bring them to justice. They replied that the pasha said that the families of the malefactors were in Nauplion, enjoying his goods and those of others, and also that they aided their husbands to break the law and worse . . . I, on my part, have written the rettor of Nauplion, and given him information about the names of the malefactors and the stolen items, according to the man who was beaten, and I am informing your Excellency. Dario wrote again, that he had heard from the governor of Nauplion, and from the pashas, that the matter of Piero Busichi had been settled, and that the Ottomans were satisfied with the results. This is all we know about this affair, but occasional Venetian records indicate that the stratioti continued to demonstrate their valor. 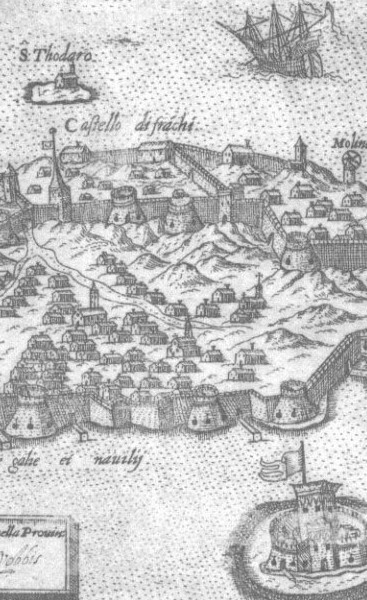 Several weeks ago Pierre MacKay wrote about his discovery in Evliya Celebi of descriptions of Florentine houses that were surviving in Athens in 1668. 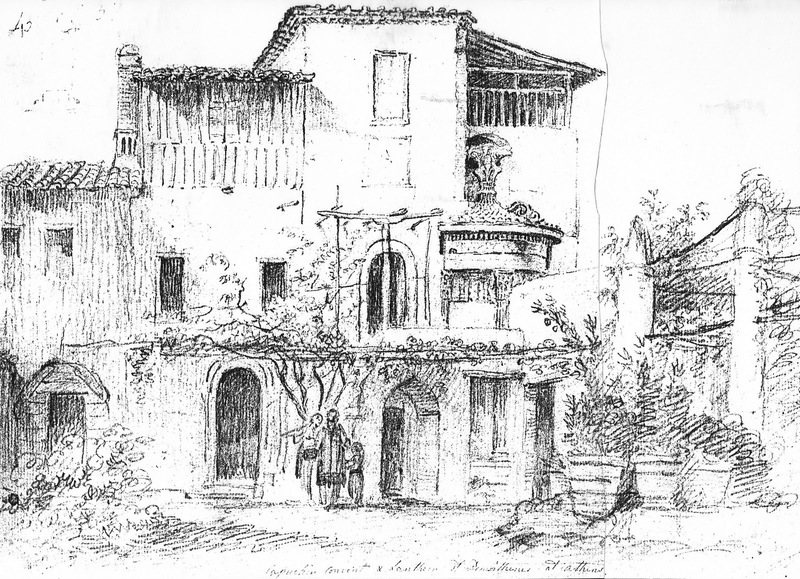 He included images from the 17th century and 1765 of probable Florentine houses on the Acropolis. I have just come across a drawing by Thomas Hope of what looks like remnants of a Florentine house surviving in the late 18th century. Hope identifies this building as the Capuchin convent. The Lantern of Lysikrates is instantly recognizable, and Byron used the lantern for a study some years later when he stayed at the convent. Though identified as a convent, the building looks like a private home and Hope has drawn a family beside the door. Three hundred and fifty years before Hope was in Athens, a Florentine built a house attached to the Lantern. Later, an Ottoman builder added a balcony over the door beneath and built a new door with an Ottoman arch. He or another Ottoman builder enclosed the upper balcony on the left with a lathe construction. Possibly the Capuchins were responsible for the addition -- stone on the ground floor, lathe above -- at the far left. That house in Ottoman Athens couldn't have held many Capuchins. [There are] fine masonry palaces, roofed all over with tile, houses like castles in their own right. They have no gardens, but from the arches over the seats in the windows and screened balconies. . . . They are sturdy houses, like castles with battlements and loopholes, and built completely of stone---there are no wooden houses or houses with earthen roofs or mud-brick walls, but only splendid houses with stone walls set with mortar and lime. This house never had battlements and loopholes, and given Evliya's tendency to dramatize, it is probable that none of them did unless built against the city wall. But if you remove the Ottoman additions you get a house that is probably early Renaissance and probably Florentine. One feels there should be evidence of this in some Florentine drawing, in the corner of some Florentine painting, of the period. The Florentines were buying Greek manuscripts and hiring Greek scholars long before the Council of 1439. Even low-grade commercial traffic between Athens and Florence over a period of 50 years should have resulted in Athenian images for Florence. The style of arbor on the right-hand side -- is it attached to columns? -- shows up in Italian frescos where sometimes awnings are added for outdoor feasting. I love the typically Greek yard with trees in pots. 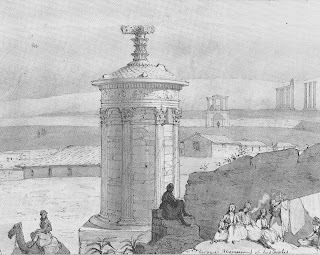 A drawing of the monument from 1834 shows no house at all, as if all construction had been cleared away. This is not necessarily evidence: 19th-century artists were relentless in pruning away non-classical elements from the views they presented. Bettina Savigny-Schinas was invited into Greek families on private occasions and to witness particularly women’s daily life in a way foreign visitors would not normally have been able to And she knew “Because I am S’s wife I get to know this country -- its inhabitants better than it is possible for other travelers or strangers, even if they stay here some time.” Brigitte Eckert's translation concerns the illness and death in Athens of Andreas Miaoulis, from whom Bettina and her husband had rented a house in Nauplion. 10 January 1835: Visit at the house of old venerable Miaoulis. 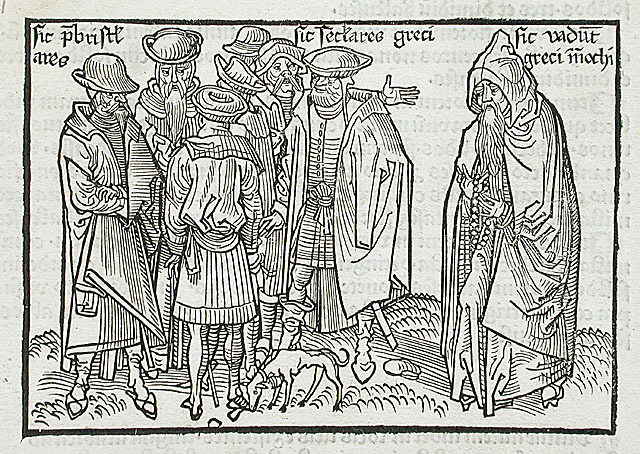 The man is suffering from podagra (gout), but still walking around, is simple but fine and dressed very neatly. I spoke to him about his son in Munich, he listened with tears in his eyes. Our conversation was in Italian. 30 April 1835: Miaoulis was deadly ill, is better now. S saw him the day before yesterday in his bed. He spoke to his wife Albanian, the actual language of Hydriots, which S is able to understand, telling her that S is the benefactor of the family, whose efforts brought his children to Munich to receive academic education. 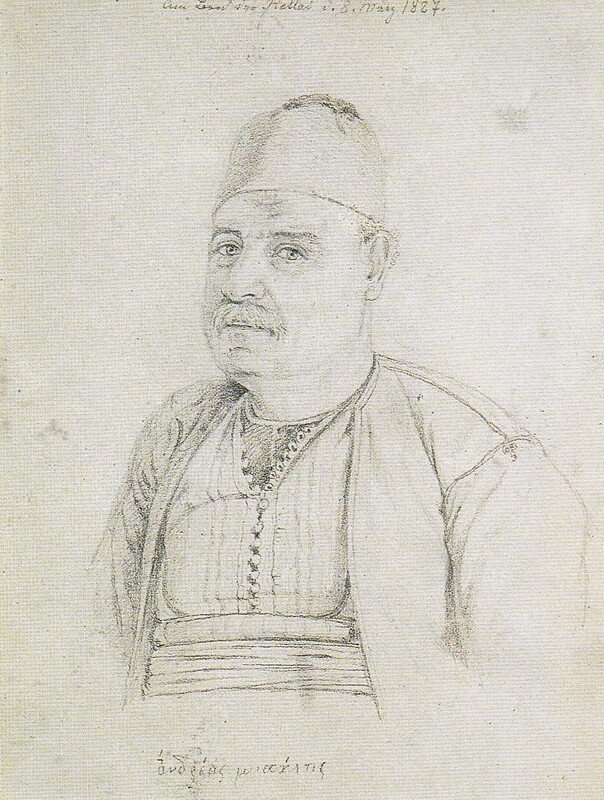 16 May 1835: Visit at Miaoulis’, found his wife and servants crying in the corridor, he is sleeping a little. There is almost no hope anymore, the fever is going on and on, he is hardly able to speak. Some weeks ago he spoke sadly to S about dying slowly in a bed, being hit by a bullet in a battle would have been preferable. With him again a part of history will be buried. First about a great occurrence in these days which moved me deeply. Miaoulis’ death. - His indisposition which had started insignificantly proceeded in spite of all means till it took the symptoms of tuberculosis . . . The king visited him several times as he was getting worse, which pleased the noble man very much. About two weeks before his death the king brought him the great Order of the Saviour. Miaoulis spoke to the king a lot about his late son whom he had loved very much and mentioned that he would like to be buried there, etc.. This there became related to the Piraeus, God knows why. The son lies, I was told by Hill (Anglican vicar in Athens and founder of the Hill School) who stood at the funeral next to the tomb, in the hall of the temple of Theseus, between two columns, far away from Pireaus, and Miaoulis, by speaking about his son, wished to be buried there. Understood was Pireaus, and nicely fantasized as the wish of the hero to rest at the side of Themistocles . . .
Miaoulis died on the 23rd, 6 o’clock in the afternoon. . . . On the 24th at 8 o’clock in the morning I went with S to the small small house where the dear man had suffered. On the staircase, in the corridor many seamen were standing deeply saddened with folded hands, they had visited the dead and could not leave the door. In the middle of the room a couch was standing, covered by a white sheet, a candle at the foot, another one in front of an icon at the head; two damask pillows supported his head. 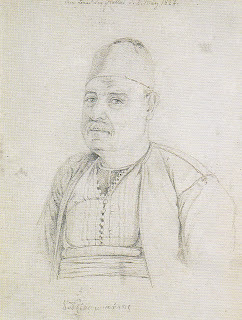 Miaoulis laid stretched out straight, one hand on the other, wearing a simple Hydriot clothing and all his orders, a fez on his head, fresh flowers all around, also in his hands. I will never forget this image of peace and quiet. No feature of pain, no contorted expression, no other colour than of his illness, like sleeping very calm and gentle. If you could have seen the great man resting on his last bed you would understand the indelible impression I am keeping in my mind. As I came and as I left I kissed his hand, I could not help it. At 3 o’clock the door was closed, at 4 the corpse was opened (and found like always in such cases the causes why death had to happen inevitably) and embalmed, then put into a coffin which was closed, unusual in this country. On 25th, at 6 in the evening the coffin was carried to the church of St. Irene not far away, accompanied by military salutes; marine officers carried him, others carried his orders. Armansperg and the French admiral in great uniforms. . . . An icon of St. Andreas was laid on the coffin and the close relatives came one after one, kissing first the icon and then the coffin, a farewell that is bidden usually to the uncovered body. Until late night people crowded to say good bye to him . . .
During the night the coffin stayed in the church, surrounded by a guard of honour. - The grave had been dug 100 steps from the tomb of Themistokles on the cape of Pireaus. On 26th at 6 o’clock in the morning the funeral procession started, leading from St. Irene’s to the harbour. The artillery had gone down earlier. First soldiers on horseback, music, the four-horse hearse surrounded by marine officerss, in front and behind them priests in twos on horseback, then the bereaved in two coaches, again masses of soldiers followed by a long dense procession of riders, ministers, diplomats, employees, palikaria, etc.. Many people had walked down at 4 o’clock and expected the procession in the harbour, embarked now following the relics of this inexpressibly noble great man and hero to his final resting place. The army will be in mourning 8 days. 67 shots announced the age of the deceased. . . .
Miaoulis was of outstanding infinite excellence compared to others by his clear unselfish noble spirit, by a heart filled with inner peace and love which made him a reconciling mediator at all occasions, and by his personal courage bordering daring together with his total selflessness. Keep his autograph safe , it is quite scarce. Keep it with the relics of Blücher, Gneisenau, Schwartzenberg, because Miaoulis deserves in every respect their company.